A presentation folder is often the first product that is placed in the hands of a potential client. Because of this, it must be impressive and informative. 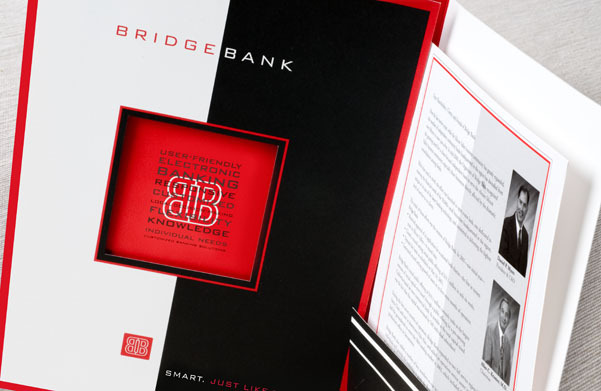 The featured project was a clever design that served two purposes — it was the cover for Bridge Bank’s annual report and was also used throughout the year as their presentation folder. The company used this unique collateral to send out its financial and company successes for the year and also housed other important presentation material such as bios, RFPs, fact sheets and more. We have been working with Bridge Bank since 2003 and are currently creating a new iconic mark for Bridge Bank. We look forward to a continued relationship of successful marketing together.